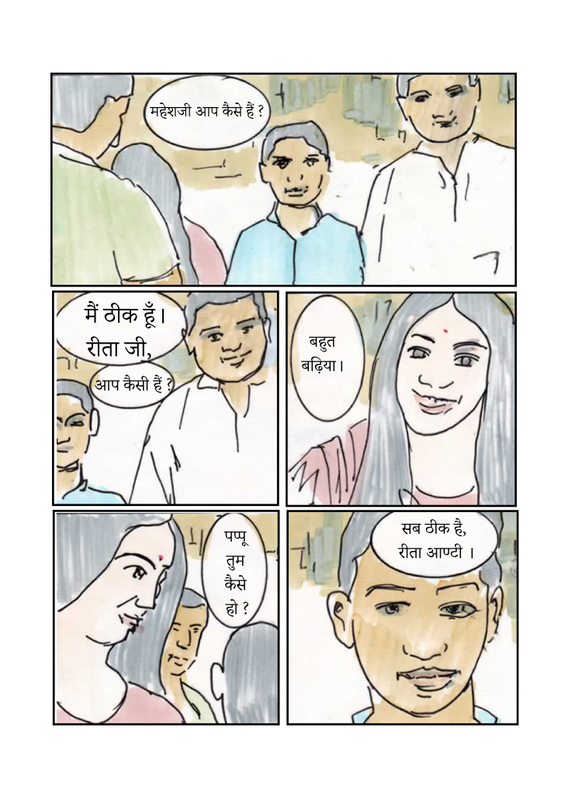 Context: Rita and Tim meet Mahesh and his small son Pappu. टिम - महेशजी आप कैसे हैं ? महेश - मैं ठीक हूँ। रीता जी, आप कैसी हैं ? रीता - पप्पू तुम कैसे हो ? Tim - How are you Mr Mahesh? Mahesh - I am well. How are you Ms Rita? Rita - How are you Pappu? A major difference from English in Hindi is that there are three words for ‘you’. There are actually many levels of respect, ranging from speaking to people of exceptionally exalted status through to addressing people of very low status. The three main levels correspond to the three Hindi words for ‘you’ which are आप, तुम and तू, which we can call formal, informal and intimate levels. आप level: used when speaking to someone older, or of higher social status than yourself. This level suggests a sense of a respectful distance between the speaker and the person being addressed. It is most common in public, with strangers and with elders within a family. तुम level: used when speaking to someone younger, or of lower social status. This level suggests a sense of comfortable closeness between the speaker and the person being addressed. It is common between friends and in a family. तू level: used in four main contexts, addressing people who are very much younger, of a very basic lower social status, people who you are in an intimate relationship with, and with God. This level suggests the possibility of extreme closeness. It is most common in addressing servants of low social status, romantic relationships, close male relationships, religious contexts and, when insulting people. The wrong level of address can be rude or insulting. Don’t address strangers as तू, officials as तुम or children as आप. The safest initial approach is.